Modern Office is a small family-owned and operated office furniture company that has been located in Eden Prairie, Minnesota for over 35 years. Our serious attention and assistance to our customers has made us an office furniture provider to over 100,000 businesses and institutions worldwide. "Very good experience from beginning to end. They answered our questions quickly and completely from before the order was placed until after it was shipped." We received it in only two days. It was easy to assemble and makes us look professional. "Personal service from a helpful staff. Recommended highly." We visited their showroom for our first order. We spent two hours there while their person patiently answered our questions. We placed this order online for 12 more chairs since we knew exactly what we wanted. 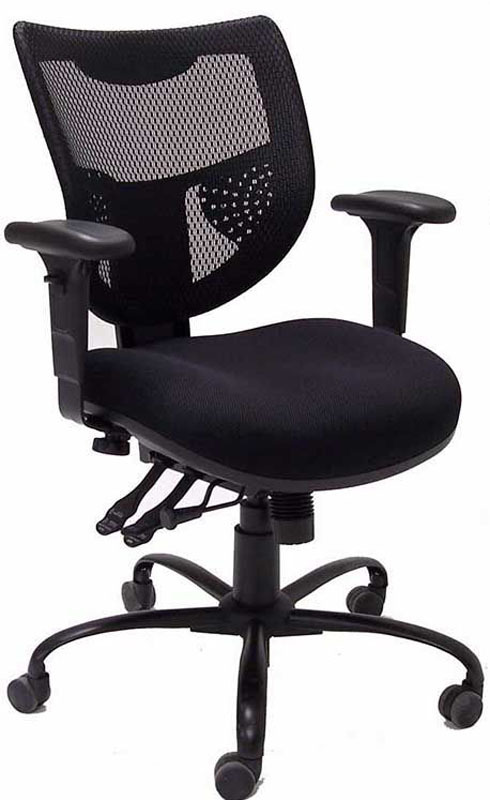 A very comfortable and adjustable ergonomic chair that all of our staff likes. "Our order was processed quickly and arrived faster than I would have expected." We have placed 3 orders for the same chair so far (30 total chairs) and we have been happy each time. Our employees love them. "This is our second purchase of a chair from Modern Office Furniture. They have a nice selection of chairs at a good price, and they are well made. Shipping was fast. Will certainly do more business with them in the future." Well made and comfortable. It's hard to know if a chair will be comfortable short of actually being able to sit in it. I have short legs so was looking for one that I could adjust the seat backwards. This adjusts easily and fits me perfectly. "Really liked the emails. They did not seem automatized. Read like a person wrote it out. Nice touch." Looks great. Staff loves it. Awesome price. "I had been looking for a specific style of desk for my home office and found exactly what I was looking for with Modern Office! The desk top is made of a solid pine that has been lightly distressed, which adds the perfect amount of character and style! The post legs are made of a sturdy, raw industrial steel with commercial grade locking casters that are functional and durable. I couldn't believe that the desk was in stock and I was able to pick it up from their warehouse the same day! I will continue to purchase all of my business's office furniture through Modern Office! " "I think this is a great store. I have been shopping here, back and forth, for a while and the products are very well designed and for me, personally when I shop, I prefer to go back to a place where I bought the previous products which last. This is the place!" This product is heaven. Best buck for the quality. The customer service was detailed and patient. I appreciate it. "From the online order to delivery- Modern Office exceeded my expectations!" "Great value, quick shipping, excellent customer service. I love my chair!" "We received the chairs in great timing! Thank you so much. I don't know if you give all your customers the special attention you gave us, but we felt that you cared about our order and kept us informed on the possibility and reality of making the tight delivery. We really do appreciate it. It gave me the confidence to tell the owner "they are on their way". The chairs are exactly what we wanted. Thanks again! " EXCELLENT CUSTOMER SERVICE! Quality product / great price! We received the chairs in great timing! Thank you so much. I don't know if you give all your customers the special attention you gave us, but we felt that you cared about our order and kept us informed on the possibility and reality of making the tight delivery. We really do appreciate it. It gave me the confidence to tell the owner "they are on their way". The chairs are exactly what we wanted. Thanks again! "The item was as advertised. This is the 2nd time I have ordered from Modernoffice ~ I am very satisfied." "Quick service when dealing with Modern Office. Product was quickly shipped via Freight Shipping. The Freight Shipping company held onto the product for a couple of extra days, but when it came down to making the appointment for delivery, they were very accomodating with making a shipping address change due to the fact that the truck was to big to fit down my street." "I spend a great portion of my day working at my desk, and over the past ten years of doing this I have developed a poor posture while sitting at my desk. My doctor suggested that I have an ergonomic evaluation. The evaluation suggested that numerous changes made to my office, one of which was a new desk chair. As I investigated my options for a new desk chair, I was sticker shocked with the pricing of associated with many of the chairs out there." "Delivery was prompt. The furniture is better looking than anticipated and was assembled easily. We had a lot of warnings not to order via the net but we are glad we did! We recomend this company to family and friends who are looking for furniture, and, if our own need arises, we will order again from this business." "Great Customer Service, love the office furniture. Would buy from them again!" "I received an email from Modern Office every time there was a change of status and a note from the manager thanking me for ordering from them. They also sent me a paid invoice the day before my chair arrived." "The quality of the chair is excellent, and I love the reclining feature which I could not find anywhere else. While this chair was very difficult to assemble from the international picture-only instructions, the sellers went above and beyond expectations to help out as much as needed! The free delivery was much appreciated, though FedEx left the item at the landlord's house, not where it was actually addressed." "I don't write many reviews, but this supplier is worth an exception. We wanted to update our lobby for our TV studio with a new reception desk. I found modernoffice.com with a google search for "cherry curved reception desk"... and the 12ft model was exactly what we were looking for. It was shipped immediately, and arrived in (13) boxes averaging about 90Lbs ea. The shipper did not offer inside delivery, but they did leave it on the sidewalk for us just outside our lobby. Assembly instructions were just OK, but the photos could have been clearer, and steps could have been better denoted. But it was manageable. At 1000Lbs, we assembled the desk pretty close to its final resting place. It only took 3 hours for 2-3 people to do. Although quite heavy, we could still move it on our carpet to make minor final adjustments in location. But follow the instructions, and leave off the glass before attempting to move once assembled. Once assembled we discovered an annoyance of the center support bumping into our knees when seated. We also saw that there seemed to be bolt holes to hold the two countertops together, seemingly eliminating the need for this support. Although they did not include instructions on how to do this, nor the extra bolts (for this mod of ours), we got some 7in threaded rods at the local hardware store and removed the center support, replacing it with just the bolts. I wish I had done this from the beginning, as it required quite a bit of disassembly & reassembly to insert them... but was really worth it in the end. We can now enjoy a uninterrupted desktop surface without the annoying knee bumper. The desk is quality and beautiful... everyone at work loves it. and it has certainly improved first impressions for our visitors. Overall, I would highly recommend this supplier, and we plan on future purchases from them. All our email inquiries on products have been promptly returned. And kind, helpful design advise has been offered from senior staff without hesitation. The customer service is excellent and knowledgeable. Very professional, and friendly. Happy customer." "Very nice chair, only one like it anywhere online that I could find." "Beautiful desk! Iâ€™ve received so many compliments. Extremely well made piece, itâ€™s sturdy and absolutely stunning. Itâ€™s also made my office so much more organized."